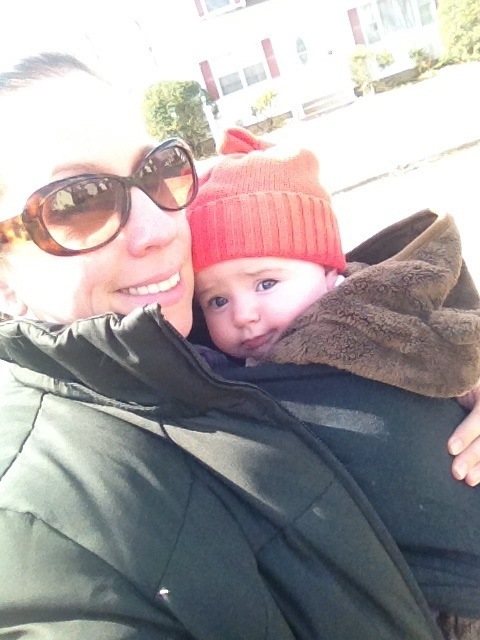 This is my 43rd installment of Babywearing Stories 365. Each installment features a babywearer in 1 photograph and their answers to 5 questions. My goal is to normalize, promote and celebrate daily Babywearing, moving beyond *what* we use to carry our babies and shifting focus back on *why* and *where* we carry. I hope to share the stories of moms, dads, and babywearing caregivers all over the world. Enjoy! I typically wear Juliana to and from school each morning and afternoon. It allows her to view the world and all of it’s new sights & sounds from a safe, cozy place close to me. Unlike the stroller where she can only see the sky and people peering over to admire her, wearing her gives her a better vantage point to feel the wind in her face, hear the birds chirping and see children playing. Added bonus ~ wearing her is great post-partum exercise for me!